The Day of the Endangered Lawyer is an international initiative set up over 7 years ago by various lawyers’ organisations (notably the EDL, the Foundation of the Day of the Endangered Lawyer and IDHAE) and on 24 January each year it calls civil societies to action in aide of colleagues who have come under threat in a given country. The Day of the Endangered Lawyer 2017 focused on the situation of lawyers in China, who for years have been victims of retaliatory measures and harassment by the Chinese authorities because of their commitment to defending the civil, political, social and economic freedoms of their fellow citizens. In Paris, the French National Bar Council and the Paris Bar joined forces via the OIAD, the EDL, the IDHAE, the Union of the Lawyers of France (SAF), the French Association of Armenian Lawyers and Legal Practitioners (AFAJA) and the National Federation of Young Lawyers’ Unions (FNUJA) to make the day a high point in lawyers’ activism. 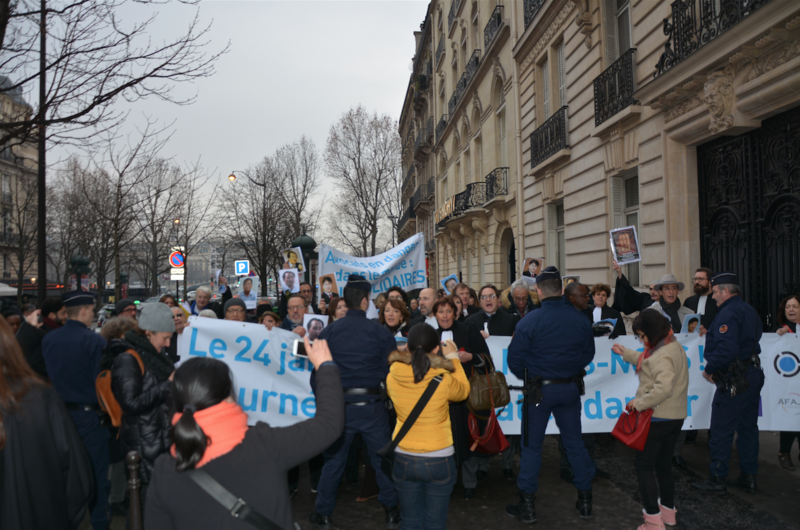 The lawyers demonstrated in gowns in front of the Embassy of China in France, and the demonstration was attended by both many lawyers and by the many journalists covering it. After this event, which called for the liberation of many Chinese lawyers who are currently being detained, in many cases secretly and under torture, a petition was deposited at the entrance to the Embassy. 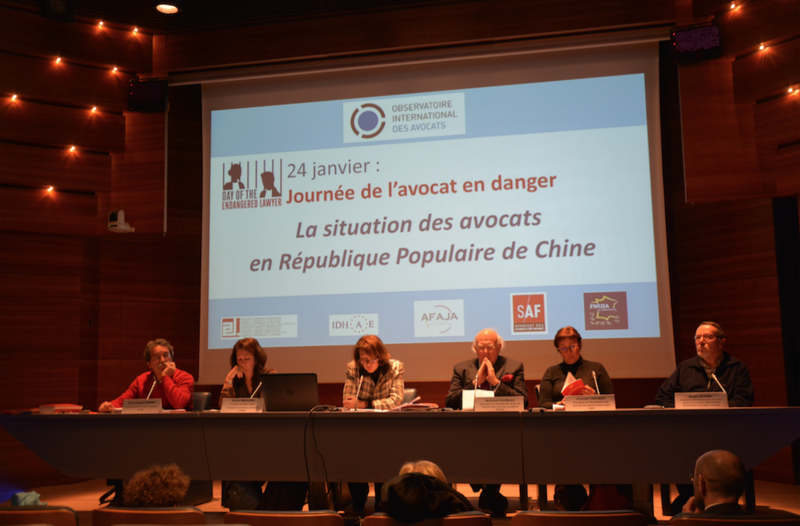 A conference then took place in the Maison du Barreau, where two round tables discussed, in the first instance, the impact and challenges of the international mobilisation in favour of lawyers under threat around the world and secondly, the specific situation of repressed lawyers in China. Among the prestigious speakers who came to share their experience and analysis, particularly worthy of note are Mr. Cheung Yiu-Leung, Vice President of the China Human Rights Lawyers Concern Group (site) based in Hong Kong, whom President Pascal Eydoux and Bar President Philippe-Henri Dutheil had spoken to at length when they convened in January 2016 in Hong Kong, and Ms Eva Pils, Reader at King’s College London. Pascale Taelman, President of European Dramatic Lawyers (EDL) and Bertrand Favreau, President of the European Bar Human Rights Institute (IDHAE) were also members of the panel. A short film produced by the International Observatory for Lawyers in Danger was shown at the seminar. It presents the striking testimonies of three Chinese Human Rights lawyers who have been forced into exile: Teng Biao, Chen Guangcheng and Liu Wei. In France, Europe, and around the world, many other bar associations have decided to take part, among them many members of the International Observatory for Lawyers in Danger: Rome, Madrid, Lyon, Montpellier, Geneva, but also the bar associations of Toulouse, Berlin, Venice, Vienna, Brussels, Antwerp, Toronto, Vancouver, Nuremberg, Athens, Hong Kong, Milan, Wellington, Taiwan, The Hague, Manila, Mumbai, Barcelona, Bilbao, Bern, Adana, Alanya, Ankara, Antalya, Bursa, Diyarbakır, Istanbul, İzmir and London. Each year, hundreds of lawyers lose at best their freedom and at worst their lives, or face intolerable pressures because they exercise their legitimate profession. The international community is not yet fully aware of this phenomenon, though it worsens year after year and threatens the Rule of Law by damaging one of the most basic civil rights, that of being defended by a free and independent defender of one’s choice. All the lawyers who rally together every 24 January, especially the French National Bar Council, call upon the international community to officially recognise this date as the International Day of the Endangered Lawyer, so that all of the threats faced by the profession can be recognised and fought against.